You may be wondering why I am writing about brownies, thinking "didn't she say they were eating healthy?" Well yes I did say that, but every once in awhile it is good to have a treat. And when they are homemade instead of from a box, then they have the ability to be healthier depending on the ingredients you use. These brownies are ah-ma-zing! I got the recipe from my mother-in-law. They are the easiest, yummiest brownie I have ever made. Did I mention how scrumptious they are? 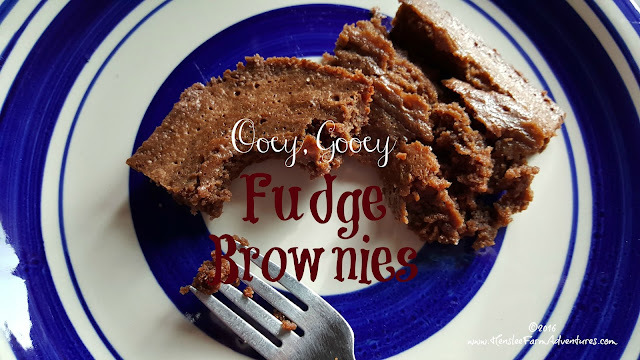 If you like fudgey brownies, then this is the recipe for you. The ease of the recipe and they way you start out reminds me of my Lazy Woman's Cobbler recipe. 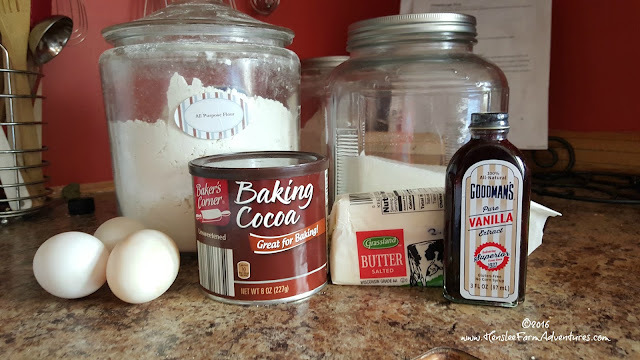 But my favorite part about this recipe, besides the chocolaty goodness, is that it is made with staples that most people already have in their kitchen! 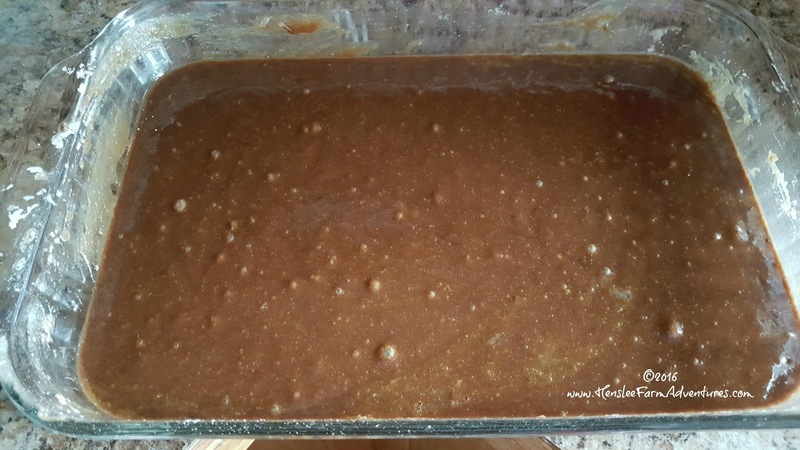 The other thing that I like about this recipe is that it makes a full 9x13 pan full of brownies. You can't get that size from a box mix! So I won't keep you waiting any longer, here is the fabulous recipe for brownies. Simple pantry staple ingredients. I love recipes like this! Preheat your oven to 350°F. 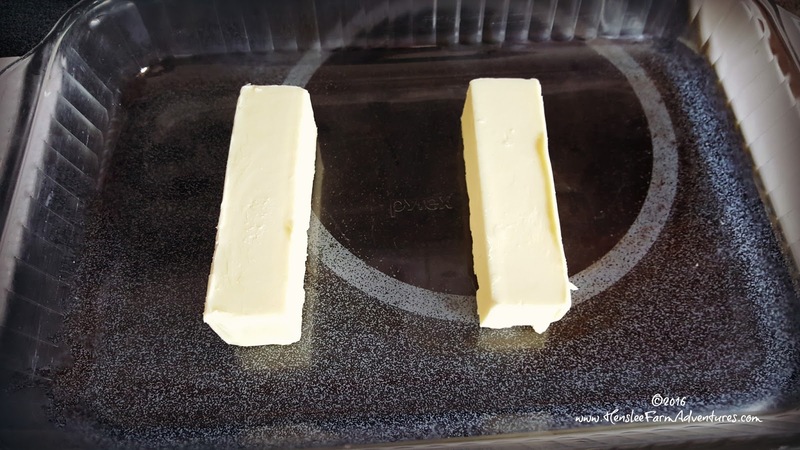 As your oven is preheating, put your two sticks of butter in your pan and put it in the oven to melt. Butter ready to be melted. 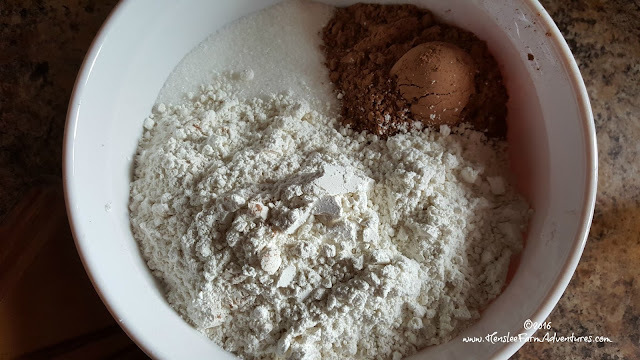 As you are waiting on the butter to melt, mix your dry ingredients together in a bowl. Dry ingredients. Be sure and mix well before adding melted butter. Put your eggs in a separate bowl. As you can see, I only have 3 eggs. That is because those are duck eggs I am using. They are huge so I only need 3 instead of 4 and the reason I love using duck eggs in baking is because they make your baked goods, lighter. 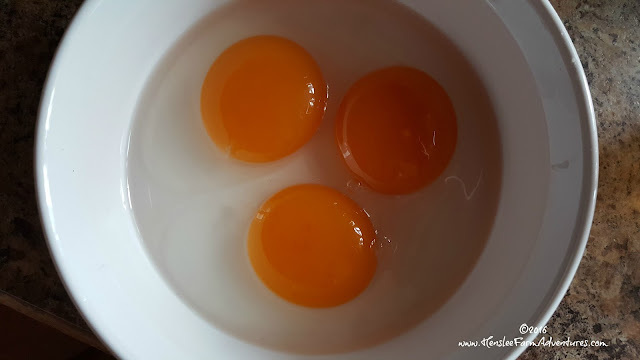 If you only have chicken eggs then use 4. I also added in the vanilla with the eggs after I beat them. The duck eggs. Great for baking! Once the butter is melted, add it to the dry ingredients and mix. The mixture may be a little hot, so instead of adding the eggs, take a little of the butter/dry ingredients mixture and add it to the eggs to temper them. Then add the eggs into the mixture. If you don't do this, you will end up with scrambled eggs. Put the mixture back into the 9x13 pan and bake for 30 minutes or until a toothpick inserted in the middle comes out clean. This next part is the hardest part of this recipe. Do your best to let cool, before cutting and eating. It was almost impossible for me to follow this step. In fact I went ahead and cut them while they were still warm, which means they fell apart a little. Really, I don't care, they were still delish! Why yes, I did take a big bite out of that piece. Yum yum! The only thing better that I could think of would be to add a scoop of ice cream right on top! The great thing about this recipe is that you can have add-ins to this mix. Like nuts? Add a cup of chopped pecans or walnuts in. Want it to be extra chocolaty? Add in some chocolate chips. I have added in the Andes mint chips before for mint chocolate brownies. So good! 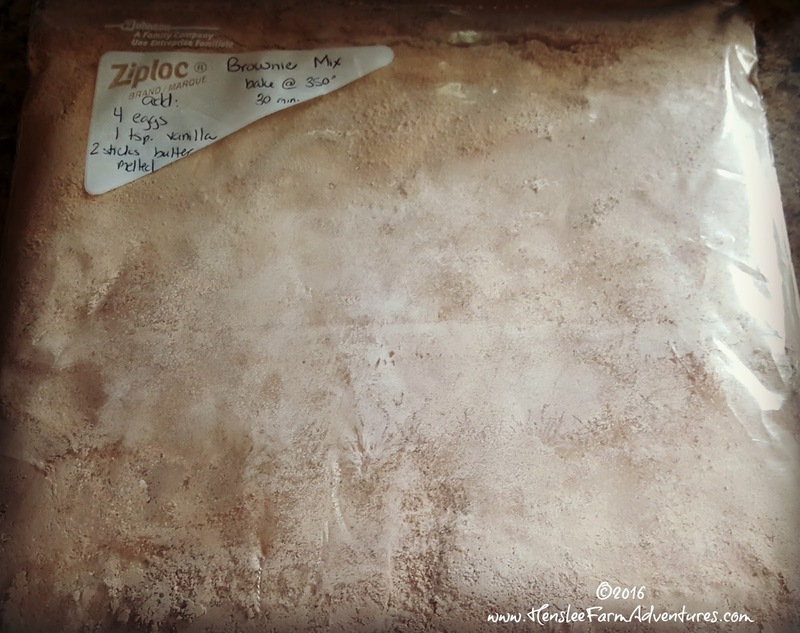 The other thing that you can do (to keep you from buying the box mix) is to mix up the dry ingredients and put them in a sealed bag ready to add the wet ingredients and bake. You've just made your own box mix! And it is so much better than the store bought stuff! Now I'm ready to make another batch. Try out this recipe and let me know what you think! Cooking from scratch has never been so easy or so good!